As you probably already know, with the Kindle Paperwhite (second-generation), you can share quotes and short comments from Paperwhite to Goodreads, Facebook, and Twitter. But Goodreads offers much more for voracious readers. You can use shelves to organize your books by those you have read, are currently reading, and want to read. You can connect with friends who have similar reading interests to discover new books. And the Updates feature enables you to see what your friends are reading and view their comments and ratings. One particularly useful feature is the capability to add books from your Amazon Cloud account to Goodreads. 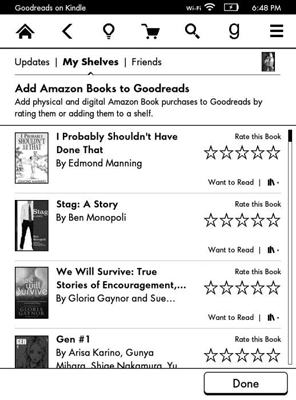 With the Goodreads app open, select Add Amazon Books (in the upper right). The screen shown in the figure below appears. From here, you can add books to Goodreads, either by rating or by adding the book to a shelf. If you’re familiar with Goodreads, you will find that the Goodreads app has much of the functionality that has been available on mobile apps and PCs. If you’re new to Goodreads, take time to play with it and discover what you can do. It can be a great tool for organizing your library and keeping track of what you’ve read, as well as connecting with other readers and friends.